WEST LAFAYETTE, Inc. -– Purdue Employees Federal Credit Union (PEFCU) executives and senior managers honored 2008-09 PEFCU Citizenship Scholarship in Honor of Ronda E. Feathers recipient Amalia R. Barber, and 2008-09 PEFCU Citizenship Award recipients Travis J. Burghardt and Katie N. Reid, during a luncheon on Thursday, October 30. 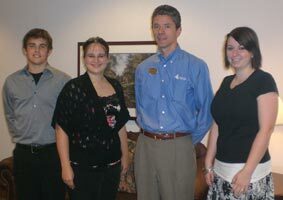 Barber, Burghardt and Reid are students in the Undergraduate Studies Program (USP) at Purdue University. with PEFCU President and CEO Bob Falk following the luncheon in honor of their academic achievements and community involvement.”] The Citizenship Scholarship in Honor of Ronda E. Feathers is presented to sophomores and the Citizenship Award is presented to freshmen. These annual $1,000 scholarship awards recognize the outstanding academic achievement and strong community involvement of USP students. Special emphasis is placed on good citizenship and how active the student has been in his/her school and hometown community. Applicants submit an essay of 250 or fewer words about good citizenship. Barber attended high school in Clinton, Ill., where she served on the leadership team for her school’s community service club as well as National Honor Society vice president. She also served on the Membership Board of her local United Way Foundation and was actively involved in her high school band. Barber currently plays baritone for the “All American” Purdue Marching Band and participates in the University Honors Program. In his hometown of Monticello, Ind., Burghardt volunteered at the White County food pantry and the Monticello Public Library. He also participated in the 2007 Relay for Life, played varsity tennis, and was co-president of the Twin Lakes High School mock trial team. Burghardt graduated 17th in class. Reid’s success as a student in the Academy of Finance at Carroll High School in Fort Wayne, Ind., led her to an internship with the Fort Wayne YMCA at Camp Potawotami. She served her community by organizing a local food drive and by volunteering at the Fort Wayne Children’s Zoo and with the Kiwanis at the Johnny Apple Seed Festival. Founded on the Purdue University campus in 1969, Purdue Employees Federal Credit Union (PEFCU) boasts assets exceeding $500 million and serves more than 56,000 members nationwide.